For some it may come as a vow of undying love in front of loved ones, for others it may come as fighting off sadness and loneliness as they work abroad for their families here. Still for some, love may come in the simplest of forms. Last night, I wasn't feeling very well. I was tired from the two days straight photo coverage plus my back cyst still really hurt. 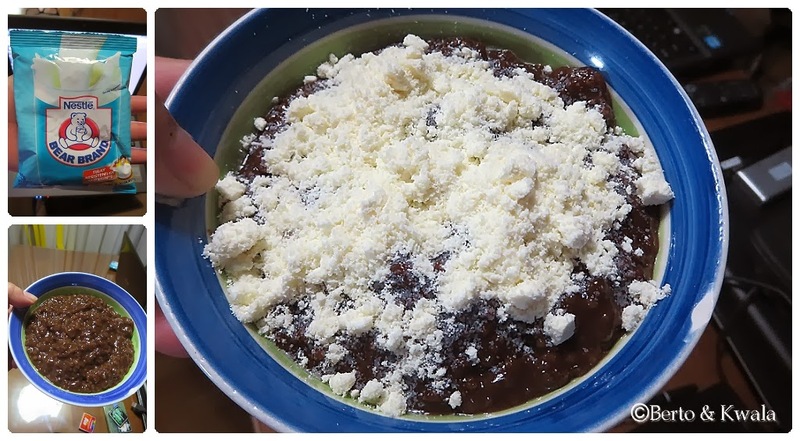 My sweet hubby offered to make me my current happy food, Champorado! So after hearing mass, he cooked 10 cups of champorado and we ate that for dinner! Considering he was tired too, actually he's more tired than I was since he's the main photographer plus he's also got a terrible toothache but despite all that, he still offered to make me my favorite food. Awwww. So as I transferred the digital photo files from our past two events (a wedding and a birthday party) I feasted on wonderful chocolatey goodness from White King and Bear Brand Powdered milk! Love comes in different forms. Last night love for me came in the form of a random act of thoughtfulness. I'm such a lucky girl!